Spiral bound method book, available in eBook format. 121 pages. Trombonist/composer, Jen Baker, has pioneered a widely diverse performing career based on redefining the role of trombone in contemporary music. Hailed for her "formidable sensitivity” (New York Times), she has “performed with brilliant mastery and virtuosity” (San Francisco Classical Voice) in festivals and concert halls worldwide. Collaborations have been with artists in site-specific mixed media performances, concert halls, and solo and chamber commissions. She is featured on the soundtrack to Werner Herzog's Oscar-nominated Encounters at the End of the World, has appeared on Good Morning America, leads her own projects as a soloist/composer/improviser, and performs on numerous recordings with Nate Wooley, Damon Smith, The Mountain Goats, Asphalt Orchestra, Flexible Orchestra, on record labels including New World, Innova, New Amsterdam, Cantaloupe, and her own label, Dilapidated Barns. Her current solo project blends site-specific field recording with live performance: “Silo Songs” involves recording in a massive concrete grain silo with new multiphonics pieces in the naturally reverberant, dome-topped silo. She currently teaches trombone and composition at Sarah Lawrence College and Brooklyn Conservatory. From the author: There has been a gaping hole in educating trombone players on non-traditional, extended techniques even though they are common to contemporary classical music. While Stuart Dempster’s The Modern Trombone and various exercises by David Baker and Donald Appert help players develop a basic proficiency, trombonists haven’t had a thorough resource for multiphonics until now. This book has been written to help others learn the art of multiphonics. It is thrilling to demystify multiphonics and other extended techniques so others can use them. 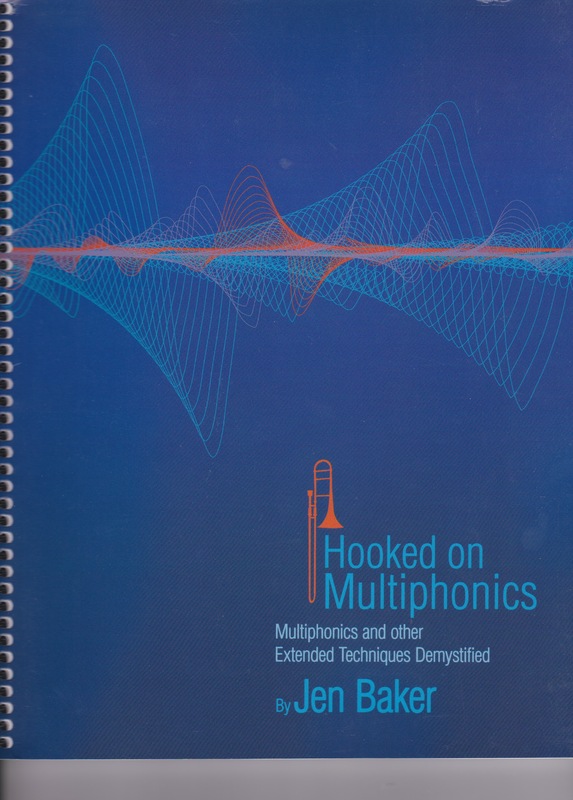 Hooked on Multiphonics enables composers and performers to navigate multiphonics with in-depth explanations and usage tips. Performers will deepen their understanding of producing a wide array of multiphonics as they are guided to develop a broader palette of sound. For composers wanting to get a stronger grasp of the many facets of trombone multiphonics, this book will delight and empower. Contents: Chapter 1 Multiphonics and Me: An introduction. This chapter includes initial steps, exploratory exercises and basic studies. Chapter 2 The Voice. Vocal cord health, incorporating singing during practice sessions, multiphonic playing, and studies are presented. Chapter 3 Refining Multiphonic Sound Production. This involves warming up, intonation exercise, ear training, and studies. Chapter 4 Timbre Covers mutes and timbre, Harmon muting, overtones with Harmon mute, mute exercises, vowel tones, split tones. Chapter 5 Through-Composed Solos and Arrangements. Five duos utilizing multiphonics are presented, arrangements and original works, from the Renaissance to the present. Chapter 6 Range, Voicing and Interval Quality. Chapter 7 Dynamics and Balance, Articulation and Timbre. Chapter 8 Specialized Extended Techniques; Split Tones, Microtones, Circular Breathing, Ensemble Writing, Instrument Deconstruction, Reeds With Trombone. Chapter 9 Sound Healing. In the words of the author: [Sound healing is] the intentional use of sound to reduce stress or disease such as physical pain and emotions. One principle of sound healing is to administer prolonged exposure to music in order to liberate various emotions such as ecstasy, revelation, or grieving. Multiphonic trombone sounds can have such vibrational power that both player and listener can physically perceive it. Due to its ability to easily tune specific frequencies and create such an enormous vibration, trombone is a magnificent healing instrument. Appendices Harmonic Series Chart, Trombone Range, Harmon Mute Harmonics. Two authorities in the trombone world, Stuart Dempster and Jim Pugh, have written glowing reviews of the book, with the latter stating: (this book) is a long overdue and wonderfully thorough look at this fascinating technique from one of the best. Until now, learning multiphonics was very much a ‘figure it out yourself’ process. Jen has laid out a smart, progressive, methodical approach starting from square one, which should enable any conscientious trombonist to get a good grip on how to perform and utilize multiphonics. Stuart Dempster adds: Jen has developed an amazingly thorough and accessible course of study through a systematic, step-by-step presentation of multiphonics. Along with Mike Svoboda’s 2008 Concert Etudes for Solo Trombone, Hooked on Multiphonics is a noteworthy, important contribution to contemporary trombone performance, pedagogy and technique. It fills a pedagogical void for trombonists wishing to master this important performance tool along with other extended techniques and lays out a logical, progressive and easy to follow approach with numerous etudes and musical examples. Its printing, layout, paper quality and cover art are all first class; its spiral bound presentation makes it easy to navigate.